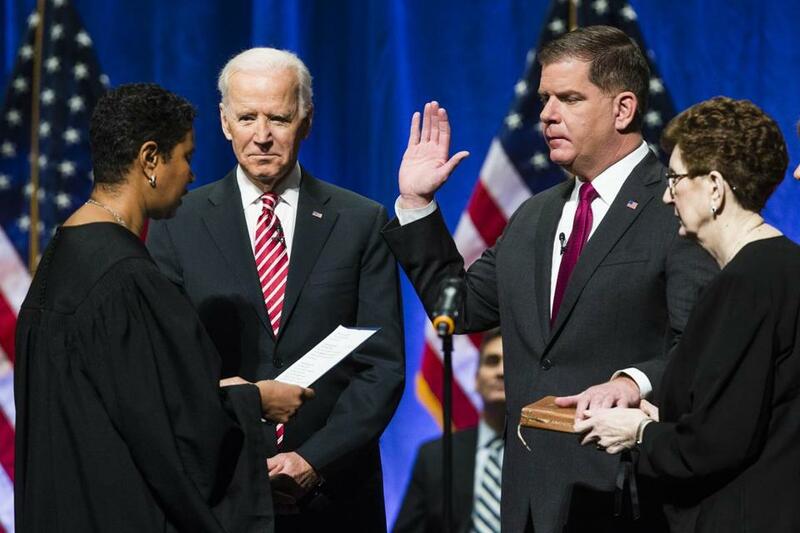 Boston Mayor Martin J. Walsh delivered his second inauguration speech on Monday. 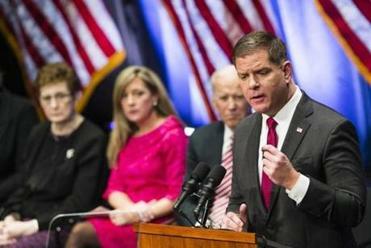 Walsh also promised to expand education and job training programs and offered a bevy of social services aimed at helping Boston’s most vulnerable populations and boosting its middle class. 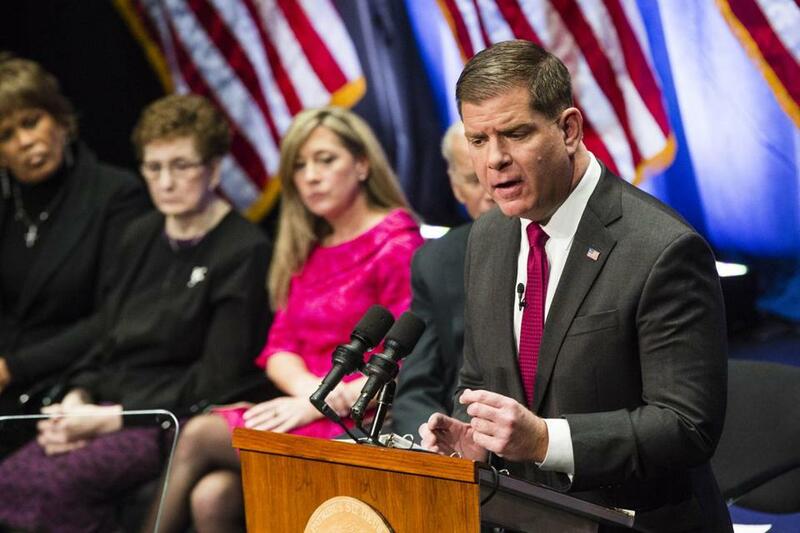 “We can be the city that is world class because it works for the middle class,” Walsh said to thunderous applause before hundreds of supporters who gathered for his swearing-in ceremony at the Cutler Majestic Theater on a frigid New Year’s Day morning. Several of his proposals sparked questions from city councilors, specifically his plans to rebuild the Long Island bridge at a cost of up to $100 million. 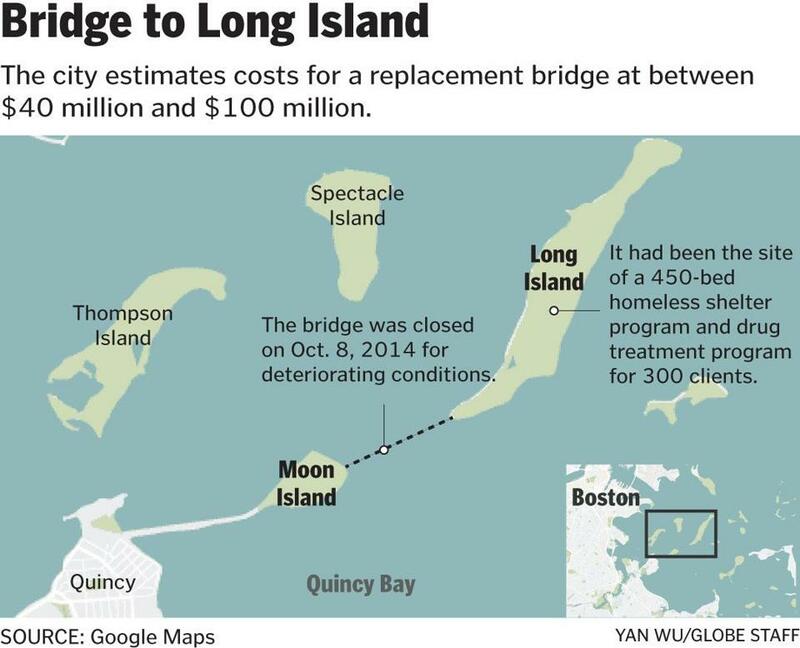 The mayor ordered an emergency evacuation of the island and the closure of the aging bridge in 2014 because of safety concerns, forcing the relocation of more than 400 homeless people and as many as 300 others in recovery programs on the island. He promised to rebuild the bridge shortly after the closure, but the project has not moved forward. “I look forward to getting into the nitty-gritty of it,” said Councilor Annissa Essaibi-George, a Walsh ally who has focused on rehabilitation and homeless programs. The mayor also announced the launch of Boston Hires — an expansion of his administration’s job training initiative that aims to secure training and what he described as “good-paying” jobs for 20,000 low-income Boston residents by 2022. 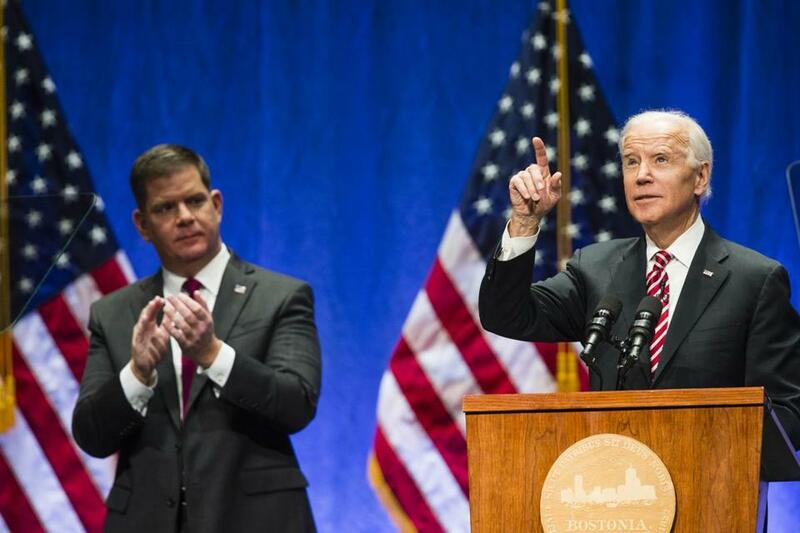 Former vice president Joe Biden was a guest Monday to Walsh’s swearing-in. The mayor said he would work with nonprofit partners and private employers, and Boston Hires will begin recruitment next month. The city would also offer training and jobs in his administration to residents and Boston public school graduates through a new City Academy program, his office said. 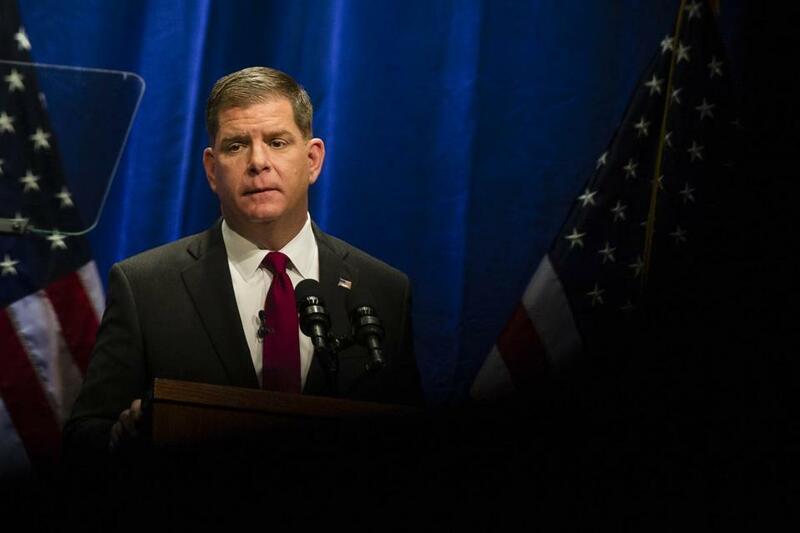 Walsh did not say how much city funding would be devoted to the jobs and training initiative. He called for the region’s colleges and universities to help build “academic pathways” for students through recruitment in local schools. In 2016, he said, 710 Boston residents attended a private college in the region on scholarships worth roughly $32 million, an increase over the previous four years of 14 percent. But he asked colleges to “do more” by collectively adding 100 full scholarships for city students. “Come into more of our schools. Admit more of our graduates,” Walsh said, addressing his remarks to the many colleges and universities in the Boston area. The mayor also announced creation of a Boston’s Way Home Fund, which seeks $10 million in private funds to support 200 new units of long-term housing for chronically homeless men and women over the next four years. The Bank of America has pledged $250,000 and to help administer the account. Biden spoke during the ceremony. In addition to replacing the Long Island bridge, Walsh also committed to developing more rehabilitation programs for drug and alcohol abuse. “We will create, on Long Island, the comprehensive, long-term recovery campus that our city and state need more than ever, to tackle the opioid crisis,” the mayor said. He did not say when construction would begin, but his office estimated the cost of a new bridge would range from $40 million to $100 million. The city would then invest in a recovery facility that would offer detox, residential treatment, peer support, and transitional housing services. Essaibi-George welcomed the proposal, though she wondered about the logistics — when construction would begin; how existing structures on the island would be used; and whether there are other uses for the island pending construction of a new facility. “How are we going to make it happen?” she asked. She also questioned what role the city of Quincy would have in plans for a new bridge. That city has opposed construction plans, because drivers would have to pass through it to reach the bridge. Walsh’s office said that partial funding for the bridge is already included in the city’s capital plan for the fiscal years 2018 through 2022. The city projects it will have more than $30 million available in a parking meter fund around the time construction could begin, though the administration did not say when that would happen. On other matters, Walsh said his administration will continue to prioritize changes and improvements to Boston schools and education programs, including an effort to renovate school buildings or build additional ones. The city will celebrate its 400-year anniversary in four years, and Walsh said his goal — laid out in an Imagine Boston 2030 plan — will be to prepare the city for the next 100 years. “We are one of the greatest cities of the world, and after nearly four centuries our greatest days are yet to come,” the mayor said. Walsh later swore in the 13 members of the City Council, including new councilors Lydia Edwards, a lawyer from East Boston, Charlestown, and the North End; Ed Flynn, a Navy veteran and probation officer whose district stretches from South Boston to the South End; and Kim Janey, whose district makes up much of Roxbury. With the new additions, the council has six women, all of color, a historic precedent and a reflection of the changing political landscape in Boston. Later on Monday, Councilor Andrea Campbell was elected council president — the first black woman to serve in that role — and she praised Walsh’s focus on affordable housing, education, and public safety in his outline of priorities for the next four years. Campbell said she also had her own priorities, particularly in public safety, such as increasing diversity within the police and fire departments and strengthening a police civilian review board. “We have an opportunity to ask ourselves, ‘What do we want for our city, what do we want for our children, and the next generation?’” Campbell said, adding that she looked forward to working with Walsh and for the priorities he set out in his speech. “One of the things I’m most excited in is him recognizing that we can always move the needle faster, and that we all have to work together, and we have to look forward,” Campbell said. “We can be the city that is world class because it works for the middle class,” Walsh said to thunderous applause.